My kids are growing up fast. Every time I blink they seem to get bigger! 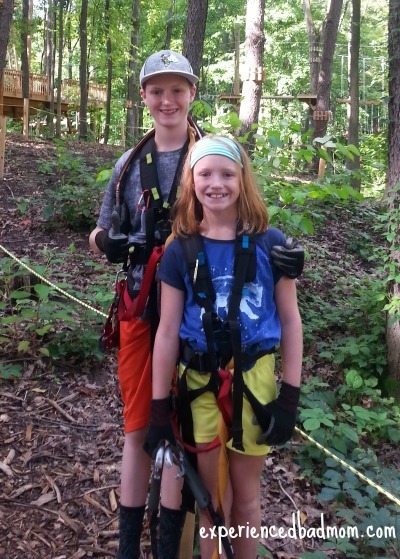 That’s why I was pleased to go on a family adventure in the trees recently at a zipline and climbing park. 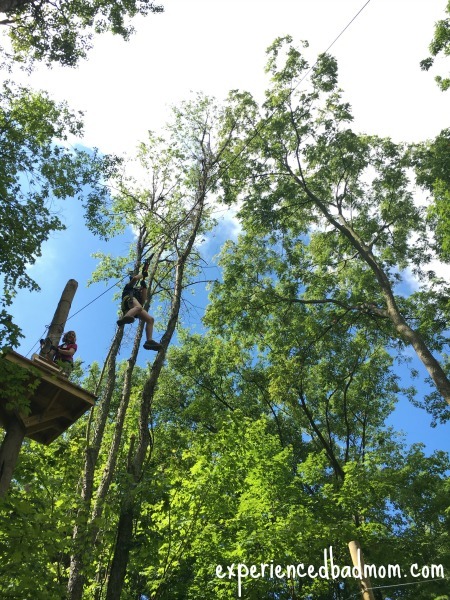 To facilitate this adventure, I was given tickets to the Grand Rapids Treetop Adventure Park. I was not financially compensated for this post and all opinions are my own (or my family’s) and are based on our visit to the Park. 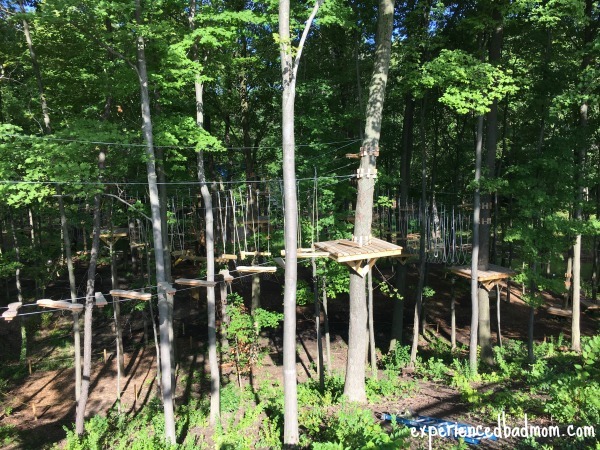 The Grand Rapids Treetop Adventure Park opened earlier this year in Grand Rapids, Michigan. At first, I thought it was in an unassuming location. Seriously, the address leads you to a bunch of trees at the edge of a parking lot, behind a movie theater. However, it is so much more than a random tree line behind a shopping center! There are 5 ropes courses rising from the forest floor to various heights: 2 easy, 1 medium, and 1 difficult course. You will also find a small course designed for kids ages 4-6, a training area where you test out your equipment, and a huge zipline. After checking in at the trailer in the parking lot, we walked down to put on our equipment and learn how to use it. Everyone got a harness, fitted by staff, that went around your shoulders, bum, and waist. There were gloves, two “clickits” to attach to the lines, and a special doo-hickey just for zipline portions (can you tell I’m so technical?). The Treetop Adventure Park is big on safety. We got approximately 30 minutes of safety training, which included instruction and time to master using the clickits and zipline doo-hickey. Then it was time for 2 1/2 hours of climbing at our own pace. Just climb up the giant net and go for it. The climbing portion of your visit is self-paced and self-guided. Now you understand why they gave you so much safety training. You have to complete one of the two easy courses before you move on to the other courses or the big zipline. I’m going to be honest right here: my family thought the 2 easy courses were hard enough! That’s right, my family was completely satisfied and challenged on the easy courses. There were tightropes to cross, wobbly swings to walk on, skateboards on wires to ride, and more aerial challenges that felt both exhilarating and scary enough for us. We spent our time at the park completing the 2 easy courses and doing the zipline (see below!). 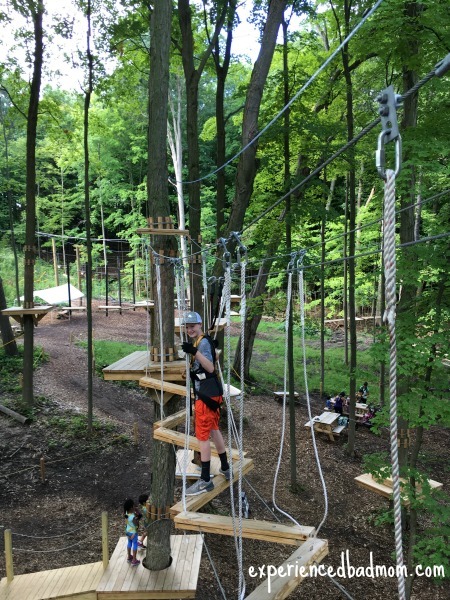 My son, 13, enjoyed the zipline on the easy course the best. My daughter, 9, liked the giant zipline. My husband and I simply liked being together as a family on a beautiful summer day in the woods! Just a note that there were six kids ages 7-12 in our climbing group the day we visited. I witnessed five of them cry at some point and/or freeze on a challenge. This included my own daughter, 9. As it is not easy to pass people on the course, you have to wait for the kids to conquer their fears and do the obstacle. This created a logjam at times, and stressful moments of parents saying “You can do it!” followed by tearful replies of “No I can’t”. One of the six tweens I saw had no problems on the courses. My teenager, 13, loved the experience. My opinion is that the park is best for teens and older. It can work for kids ages 7-12, too, but only if your child has the kind of temperament suited to the course. Is she adventurous? Comfortable with heights? Handle stress well? If yes, then give it a try. If not, maybe wait a couple years. 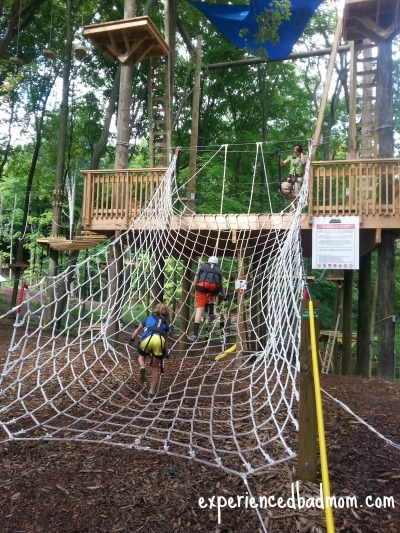 The Grand Rapids Treetop Adventure Park is located at 2121 Celebration Drive NE, Grand Rapids, Michigan. Go online to book tickets and select a start time. Tickets are for 3 hours, which includes safety instruction and climbing time, and cost $39 for adults, $35 for kids ages 7-13, and $20 for kids ages 4-6 on the junior course. My thanks to the park for providing a fun, challenging family adventure in the trees! It’s definitely a neat experience! How fun! My daughter would LOVE to do this. My son? Well, I’m not sure. But I know she’d love it. I liked it, too! I’m still not sure my husband was 100% comfortable hanging up there, LOL. Oh my goodness! This looks like so much fun! I wish there was something like this here in Arizona! I believe we have zip lining but not a course that looks as beautiful as that one! So happy you all had a great time! Thanks so much for sharing with the #happynowlinkup ! I’ve not done anything like this! How very fun. Whistler now has a wonderful zipline apparently as does Grouse. Yet more reasons to come on back and visit, Katy! I like ziplines the best. Just a fun ride. Now that suspension bridge somewhere in North or West Van scared the pants off me. I couldn’t do it! Sounds like great fun but I get that it might be better for teens and above. We did the zip line at the San Diego Wild Animal Park a couple of times. We were driven up to the top of the hill then zipped down to the bottom over all of the animals in the open savannah. It was a blast! Wow. This is bringing back so many memories. I took a college course that had us all at a ropes course, and even at 21 I was freezing on the ziplines. Those things can be really scary!!! Thanks so much for sharing your experience, and tell your kids I’m impressed they did it at their age! My kids would LOVE something like this! I on the other hand, would be hyperventilating the ENTIRE time… holding up the entire population while I froze up there. No, who am I kidding? I would be watching from the GROUND. And like you- enjoying the family time on a beautiful day! Ha ha ha! Sounds like a plan to me!